Arizona Tees or Camis Only $0.01 | A Savings WOW! 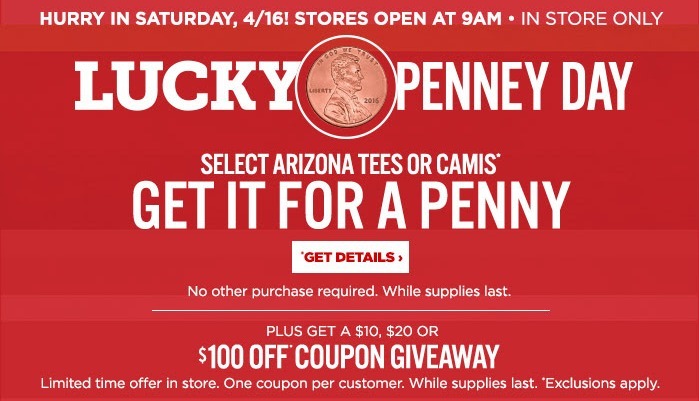 This Saturday, April 16th, you have the chance to get select Arizona tees or camis for only a penny at JCPenney stores. The stores open at 9 am and there is no other purchase required to get this deal. It’s good while supplies last. Plus, there’s also a $10, $20 or $100 off coupon giveaway April 16th and 17th. Limited time offer in store. One coupon per customer. While supplies last. Exclusions apply.